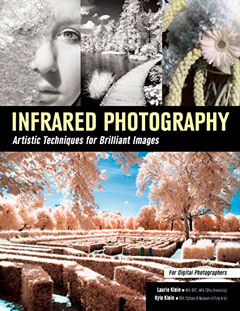 2010 marked the centenary of the first published infrared image. This is the Infrared 100 blog, which celebrates that centenary and discusses all aspects of infrared imaging: near and far. Laurie Klein, of 'Photographing the Female form with Digital Infrared' fame (and a new book on the way ... see my previous post) will be in London next week to present two talks at the SWPP Convention. I won't be able to get along but I recommend Laurie's 'Female Form' book and am looking forward to seeing the new one. In any event, how often do you get to hear from someone who studied with Ansel Adams? I've been notified of three photographic books that may be of interest, coming out over the next few weeks (or May in one case). 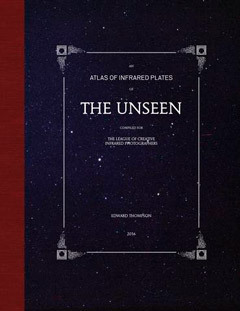 Ed Thompson's The Unseen: An Atlas of Infrared Plates has a May 2016 publication date from Schilt Publishing and a cost of €45. More information on their web site. I love the idea that this is somehow an old-fashioned atlas of hitherto unknown territory ... down the spectrum with gun and camera (without the gun) in the manner of a Victorian explorer. One thing I would take issue with is the publisher's quote that "Thompson has created a swan song to the medium of infrared photography" since the technique is alive and well. What this is a swan song to is infrared film of course, and especially the false-colour infrared film that Kodak used to produce, and of which Ed is an accomplished exponent. I've mentioned Laurie Klein, and her book Photographing the Female Form with Digital Infrared, before. Her follow-up is almost with us, co-written with her son Kyle Klein, and published by Amherst on January 12th 2016 at $37.95 (list). I haven't seen the book on paper as yet, but there's a comprehensive preview on Amazon and it will also be available from other stores who stock Amherst's books.. 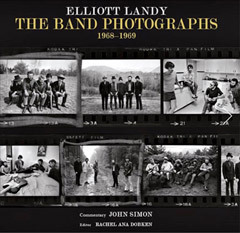 Finally, a quick note to say that Elliott Landy's Kickstarted book of The Band Photographs (Big Pink etc) is now available in various enhanced formats from his web site ... and going fast ... (there's a preview there as well as on Amazon) and from book stores. Prices range from $45 to $500 and Elliott's web site is offering the first edition print of the book. I mention this because, although they are in a minority, there is a section of infrared photos amongst this set. I wrote more about this almost exactly a year ago.